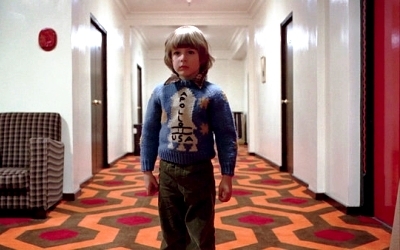 In Rodney Ascher’s Room 237 (2012), we hear from people who believe they have decoded the far-reaching theories, hidden symbols and messages buried in Stanley Kubrick’s 80s horror masterpiece, The Shining. Carefully examining the film forwards and backwards, Room 237 is equal parts captivating, intriguing and provocative. To celebrate the film’s DVD release this coming Monday (1 April), we’ve been handed THREE DVD copies of Ascher’s compelling documentary to offer our readers, courtesy of Metrodome Distribution. This is an exclusive competition for our Facebook and Twitter fans, so if you haven’t already, ‘Like’ us at facebook.com/CineVueUK or follow us @CineVue before answering the question below. A subjective documentary that explores the numerous theories about the hidden meanings within Kubrick’s The Shining. The film may be over 30 years old but it continues to inspire debate, speculation, and mystery. Five very different points of view are illuminated through voice over, film clips, animation and dramatic re-enactments. Together they’ll draw the audience into a new maze, one with endless detours and dead ends, many ways in, but no way out. Which American horror writer penned the novel of the same name that The Shining is based on? Room 237 is available to own on DVD from 1 April, courtesy of Metrodome Distribution. The competition closes at 6pm on Thursday 4 April, 2013.